Holidays are a time for tradition. What you make for special dinners, how you decorate and where you visit are all part of a tradition that goes back for years. Of course, there is nothing wrong with starting the occasional new tradition. That is especially true when there are kids in the picture. Elf on a shelf, anyone? In the next few weeks, you have a chance to lay out all your holiday plans and begin coordinating with the rest of the family. You can start by getting your own house in order. The decorations need to be taken out of storage and the rest of your unwanted junk needs to be cleared out. 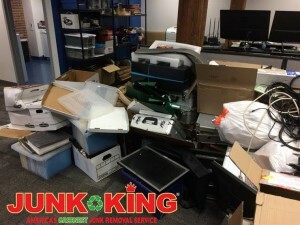 Junk King Richmond can’t help with hanging lights but they can certainly make a huge difference when it comes to removing unwanted clutter. Having guests come over for the holidays shouldn’t come as a surprise. You’ll know exactly when everyone is showing up. That means you don’t need to cram clutter into the closet or garage at the last minute. Of course, those storage areas might already be overflowing with clutter. That should be the first areas to sort through before the Junk King crew shows up. Sorting through all your stuff will probably take up the most time for this process but it will be time well spent. As for the bigger stuff you might want to get rid of like an old sofa or recliner, you can leave that right where it is. The Junk King crew will pick it up right on the spot. That is what you’re hiring them for, right? You shouldn’t feel guilty about tossing out some items that might still be useful to someone else. That’s because Junk King will go out of their way to make sure you items can be dropped off at a charity. That way they can be put back into circulation and kept out of a dump. Once Junk King Richmond has worked their “magic” you can focus on getting your home ready for the guests. All it takes is one call to Junk King Richmond to make your home junk free for the holidays. This entry was posted in Richmond Junk Removal and tagged clutter, holidays, Junk King on October 31, 2017 by Junk King. Last updated November 2, 2017 .